Biodosimetry methods have been used since the 1960s for determining the amount of ionizing radiation to which an individual has been exposed. In the absence of physical dosimetry measurements or calculations, or when the physical dose estimates are in dispute, biodosimetry often provides the only measure of radiation dose. Traditionally, cytogenetic biodosimetry techniques have been used, the two most common being the dicentric chromosome assay (DCA) and the cytokinesis-block micronucleus (CBMN) assay. The DCA was the first well-developed assay for biodosimetry. It has been standardized for biological dosimetry using manual microscopy and can generate accurate and reproducible dose estimations between 0.1 and 5 Gy., Due to low and stable background levels in unirradiated individuals, the assay is considered to be sensitive as well as specific to ionizing radiation. The assay, however, suffers from a few disadvantages, namely that the damage is unstable (decreasing with a half-life of about 3 years ), cells must be cultured for 48 h prior to analysis to allow cells to cycle into mitosis where the chromosomes can be visualized, and manual scoring of dicentrics is time-consuming and labor-intensive. The CBMN assay also measures DNA damage from exposure to ionizing radiation, with the frequency of micronuclei (MN) in binucleated cells (BNCs) being translated into a dose of ionizing radiation., Like the DCA, the CBMN assay has also been standardized for biological dosimetry using manual microscopy and can generate accurate and reproducible dose estimations between 0.3 and 5 Gy. However, this assay is less specific to ionizing radiation than the DCA, and background levels of MN are more affected by lifestyle factors such as smoking, age, diet, and gender., In addition, lymphocytes containing unstable, radiation-induced MN decrease with a half-life of about 1 year. Furthermore, cells must be cultured for 72 h as compared to 48 h for the DCA. Nevertheless, microscope-based scoring is easier and faster than standard DCA scoring and requires less technical expertise. Recently γH2AX has been identified as a marker for radiation exposure. H2AX is a histone that becomes phosphorylated (γH2AX) at the site of DNA double strand breaks (DSBs), and it has been shown that γH2AX foci correspond one-to-one with DSBs,, and increase linearly with dose., The kinetics of the response are well known, with γH2AX foci appearing within minutes following radiation-induced DNA damage in lymphocyte cells, reaching a maximum between 30 min and 2 h after exposure. As the DSBs repair, the γH2AX foci start to dephosphorylate rapidly in the first 24 h, approaching baseline values within a few days., This rapidly changing response makes it difficult to determine the dose received with accuracy. Nevertheless, the presence of γH2AX foci is an indication of exposure to some level of radiation, and since samples can be processed within hours of exposure, the enumeration of these foci can be useful as a rapid indicator of exposure to radiation for up to 3 days. All of the aforementioned biodosimetry methods still depend on microscope-based analysis, which is limited by the time required for slide preparation, scanning, and manual scoring. In the case of a large-scale R/N event, automation of sample analysis by flow cytometry can mitigate these issues. With new technologies, such as the imaging flow cytometer (IFC), it is now possible to address some of the drawbacks encountered with traditional flow cytometry and successfully adapt these assays to automated cytometry methods. This would significantly increase sample throughput to potentially hundreds of samples per day in a single laboratory and thousands across a laboratory network and would improve the applicability of biodosimetry as a casualty triage tool following an R/N emergencies. This paper describes how the recent advances in IFC technology have been applied to biodosimetry. The IFC combines the statistical power of traditional flow cytometry with the sensitivity and specificity of microscopy. The IFC is similar to traditional flow cytometers in that individual particles in suspension are introduced into a fluidic system where they are hydrodynamically focused into a core stream in the flow cell. Particles are then interrogated by a brightfield (BF) light-emitting diode light source and at least one laser to create transmitted and scattered light signals along with fluorescent signals based on how each particle is labeled. The specifics of the fluorescent markers and resultant signals vary and depend on the end-point being measured. Several objective lenses collect the emitted and scattered light and fluorescence from each particle as it flows through the flow cell. With traditional flow cytometry, the outputs are a measure of fluorescent intensity and scatter signals which can be used to generate histograms or bivariate plots of the data that require further interpretation. With the IFC, the BF, transmitted, scatter, and fluorescent signals are collected by a high numerical aperture lens (20×, 40× or 60×) and decomposed into specific ranges according to their wavelengths. These wavelength ranges are then focused onto different channels of a charge-coupled device camera within the spectral range of 430–800 nm. These channels capture the sub-images, which can be viewed as individual channels or combined to observe the colocation of signals [Figure 1]. An additional function of the IFC is the extended depth of field (EDF) option, which allows light from different focal planes to be imaged on the detector plane simultaneously. The EDF option allows all structures and probes, such as chromosomes or γH2AX foci, to be focused into a single two-dimensional image that increases the ability to count spots at different focus depths within the cell. Thus, the IFC provides an image, with numerical representations of image-based features, for every particle that passes through the flow cell. The enormous benefit of the IFC over traditional flow cytometry is the ability to then use imaging analysis algorithms on high sample throughput datasets. Furthermore, once established, the analysis templates can be easily shared between similar systems and therefore between laboratories for standardization within biodosimetry networks. The imaging capabilities of the IFC provide a powerful tool which could allow for significant increases in sample throughput of existing techniques in biodosimetry that are typically analyzed by microscopy. Instead of transferring samples from suspension to slides for analysis, which can be very time-consuming, samples can be processed directly from suspension on the IFC. Particles are collected at a rate of up to 5000 events per se cond and saved to data files that can be analyzed at any time post-acquisition. In addition, the IFC can be enhanced with an auto-sampler that allows for unattended sample loading from 96-well plates. This feature will potentially enable increased automated analysis of a large number of samples for high-throughput biodosimetry. Recently, the CBMN assay has been adapted as an IFC-based method.,,,, This significant advancement over the traditional slide-based method involves standard culture of whole blood for 72 h, lysing of red blood cells, and labeling the DNA with an intercalating DNA stain (DRAQ5). Samples can then be immediately analyzed, in suspension, on the IFC or stored for a few weeks at 4°C before analysis. This IFC method of analysis has been demonstrated to automatically image, identify, and enumerate BNCs and MN using a spot counting algorithm in IDEAS, the data analysis software that accompanies the IFC. This has resulted in a rapid, robust method that is potentially more applicable for high-throughput biodosimetry than traditional methods [Figure 2]. Recent optimization of the customized data analysis template has resulted in a dose response calibration curve that is similar in magnitude to others published in the literature using automated or semi-automated methods for scoring the CBMN assay. 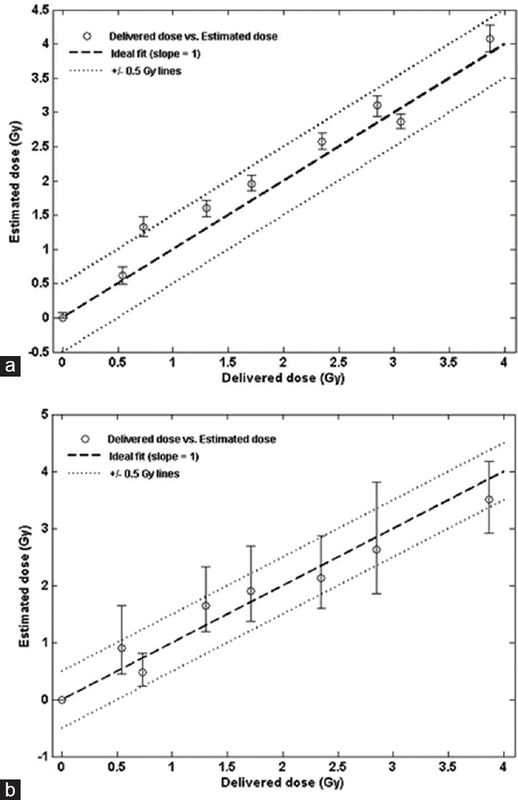 This optimization allows for the generation of dose estimations up to 4 Gy with an accuracy of ± 0.5 Gy, similar to manual CBMN scoring in triage mode (200 cells/sample). Recently, it has been demonstrated that the IFC-based method offers a significant improvement over traditional methods as dose estimates with ± 0.5 Gy accuracy can be obtained using reduced initial blood culture volumes and only 48 h of culture time [Figure 3]. With respect to the DCA, imaging of individual chromosomes in suspension is challenging due to their small size when compared to larger intact cells. Distinguishing chromosomes from cellular debris using traditional flow cytometry is difficult and moreover, identifying and differentiating between mono- and di-centric chromosomes as required for the DCA is even more complex. With the imaging capabilities of the IFC, it is now possible to identify and enumerate individual chromosomes and to distinguish between mono-, di-, and multicentric chromosomes as demonstrated by Beaton-Green and Wilkins , [Figure 4]. 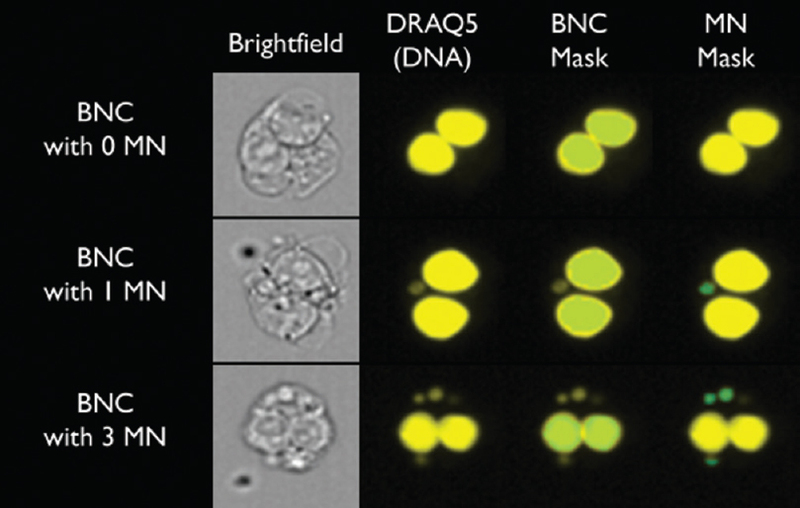 In this method, chromosomes are released from the cell and labeled with a centromere probe (fluorescently labeled pan-centromere peptide nucleic acid) and stained for DNA content with an intercalating DNA stain (such as DRAQ5) allowing individual chromosomes to be identified. In addition, with the use of the EDF option, it is possible to bring all small objects in the field of view, such as chromosomes, into focus. Once the chromosome population has been identified, the spot counting algorithm can be applied to the centromere signal. The spot count feature allows the number of centromeres on each chromosome to be counted automatically and the frequency of dicentric chromosomes to be quantified. From this, calibration curves can be generated, and dose estimates can be made for biodosimetry as with traditional microscope-based DCA. A method for performing the γH2AX assay using IFC has been developed, and it has been demonstrated that nuclear fluorescence increases with dose up to 8 Gy. Bourton et al. compared the number of foci measured by IFC using PE to stain γH2AX foci and DRAQ5 to stain DNA content [Figure 5] with the number of foci measured using microscopy. Their results indicated that a lower number of foci were measured by the IFC, but the relative difference between the two methods was maintained. This is similar to results from the CBMN assay performed using the IFC, where the frequency of MN measured was lower than what is typically measured by microscopy. For biodosimetry purposes, when calibration curves are generated for each method, these differences cease to be an issue. There has been much effort recently on the development of assays for high-throughput biodosimetry for application following a mass casualty R/N event. Although the treatment of casualties is mostly dependent on emergent symptoms rather than dose, biodosimetry provides additional information that can modify treatment as more accurate doses become available. The ideal method would be a field deployable point-of-care (POC) method that would provide accurate dose estimates for thousands of individuals within hours of the exposure. There are several emerging technologies including gene expression, protein, and metabolomics markers that have potential to address this gap, however, they are currently less accurate than traditional cytogenetic techniques. In the absence of established rapid POC assays, fully automated cytogenetic and DNA damage assays would allow samples to be processed 24 h a day with little operator intervention reducing the delay between exposure and dose determination. Current methods, using microscopy-based analysis, are limited by the requirement to generate slides before analysis can commence. The use of the IFC removes this step and allows samples in suspension to be analyzed on the IFC immediately after processing, saving several hours. With the adaptation and miniaturization of these assays to a 96-well plate format, IFC analysis could be conducted on multiple samples without the need for an operator to manually change samples. By reducing the amount of operator intervention, the issues of scorer bias, fatigue as well as inter-scorer variability would be largely mitigated. With the continued advancement of technology, portable IFCs will be field deployable, allowing the γH2AX assay to become a POC method. In addition, the development of automated sample processing systems such as the rapid automated biodosimetry tool  will allow the entire assay to be performed automatically. Once all the sample data have been collected, it can be batch processed with pre-established templates for that assay. Since the analysis templates can be shared between networks with similar instrumentation, standardization across laboratories becomes more repeatable, and less dependent on the individual scorers. As well, since all of the particles are imaged and saved, any verification of the samples or reanalysis of the files is easily performed. As is typical with automated and semi-automated methods, the amount of scored damage is less than that of manual scoring.,,,, This is largely the result of a reduction in the number of allowed false positives in the automated algorithms. As long as the calibration curves for each assay are carefully prepared with the same technique as the samples, the automated analysis algorithms are capable of generating accurate dose estimates., In addition, the imaging algorithms allow for an enormous increase in the number of measured parameters for each particle (based on features such as shape, signal, morphology, and numerous combinations thereof) which have the potential to be used for multi-parametric analysis of each assay. The adaptation of these techniques to IFC will result in a toolbox of high-throughput methods which can be easily shared within a network and can be used together to facilitate human monitoring management during a mass casualty R/N emergency. The γH2AX IFC assay will be able to rapidly identify those who have been sampled within a day of the suspected exposure. This rapid triage capability will reduce the number of individuals who will require more accurate dose estimates with the CBMN or DCA IFC methods. Subsequently, these high-throughput CBMN and DCA methods will be able to provide rapid dose estimates to the medical community with enough accuracy to assist in planning the medical management of these individuals. Moreover, rapid identification using γH2AX IFC of those who have not been exposed will provide these individuals with assurance that will help reduce their stress during such an event. As emerging technologies are developed and validated, they could be used in combination with the γH2AX assay to improve the accuracy of dose estimates in the field. With the increased sampling capacity for cytogenetic techniques, additional biodosimetry could be performed at a later time, with more accuracy, to further assure any concerned individuals. The authors would like to thank Dr. Sherree Friend (Amnis, a part of MilliporeSigma) and Dr. Christopher Parris (Brunel University) for permission to use modified images. We would also like to thank Sylvie Lachapelle and Barbara Kutzner (Health Canada) for their technical assistance. Funding was provided by the Canadian Safety and Security Program. This work was carried out as part of the International Atomic Energy Agency (IAEA) Coordinated Research Project E3.50.08, Strengthening of 'Biological Dosimetry' in IAEA Member States: Improvement of Current Techniques and Intensification of Collaboration and Networking among the Different Institutes. International Organization for Standardization. Radiation Protection – Perfomance Criteria for Service Laboratories Performing Biological Dosimetry by Cytogenetics. ISO 19238. Geneva: ISO; 2014. IAEA. Cytogenetic Dosimetry: Applications in Preparedness for and Response to Radiation Emergencies. EPR-Biodose 2011. Vienna: IAEA; 2011.
International Organization for Standardization. Radiation Protection – Performance Criteria for Laboratories Using the Cytokinesis-Blocked Micronucleus Assay in Blood Lymphocytes for Biological Dosimetry. ISO 17099. Geneva: ISO; 2013. Fenech M, Denham J, Francis W, Morley A. Micronuclei in cytokinesis-blocked lymphocytes of cancer patients following fractionated partial-body radiotherapy. Int J Radiat Biol 1990;57:373-83. Sedelnikova OA, Pilch DR, Redon C, Bonner WM. Histone H2AX in DNA damage and repair. Cancer Biol Ther 2003;2:233-5. Rogakou EP, Boon C, Redon C, Bonner WM. Megabase chromatin domains involved in DNA double-strand breaks in vivo. J Cell Biol 1999;146:905-16. Andrievski A, Wilkins RC. The response of gamma-H2AX in human lymphocytes and lymphocytes subsets measured in whole blood cultures. Int J Radiat Biol 2009;85:369-76. Horn S, Barnard S, Rothkamm K. Gamma-H2AX-based dose estimation for whole and partial body radiation exposure. PLoS One 2011;6:e25113. Coleman CN, Sullivan JM, Bader JL, Murrain-Hill P, Koerner JF, Garrett AL, et al. Public health and medical preparedness for a nuclear detonation: The nuclear incident medical enterprise. Health Phys 2015;108:149-60. Sullivan JM, Prasanna PG, Grace MB, Wathen LK, Wallace RL, Koerner JF, et al. Assessment of biodosimetry methods for a mass-casualty radiological incident: Medical response and management considerations. Health Phys 2013;105:540-54. McNamee JP, Flegal FN, Greene HB, Marro L, Wilkins RC. Validation of the cytokinesis-block micronucleus (CBMN) assay for use as a triage biological dosimetry tool. Radiat Prot Dosimetry 2009;135:232-42. Weber J, Scheid W, Traut H. Time-saving in biological dosimetry by using the automatic metaphase finder Metafer2. Mutat Res 1992;272:31-4. Decordier I, Papine A, Plas G, Roesems S, Vande Loock K, Moreno-Palomo J, et al. Automated image analysis of cytokinesis-blocked micronuclei: An adapted protocol and a validated scoring procedure for biomonitoring. Mutagenesis 2009;24:85-93. Willems P, August L, Slabbert J, Romm H, Oestreicher U, Thierens H, et al. Automated micronucleus (MN) scoring for population triage in case of large scale radiation events. Int J Radiat Biol 2010;86:2-11. De Sanctis S, De Amicis A, Di Cristofaro S, Franchini V, Regalbuto E, Mammana G, et al. Cytokinesis-block micronucleus assay by manual and automated scoring: Calibration curves and dose prediction. Health Phys 2014;106:745-9. Rothkamm K, Barnard S, Ainsbury EA, Al-Hafidh J, Barquinero JF, Lindholm C, et al. Manual versus automated γ-H2AX foci analysis across five European laboratories: Can this assay be used for rapid biodosimetry in a large scale radiation accident? Mutat Res 2013;756:170-3. Livingston GK, Wilkins RC, Ainsbury EA. Pilot website to support international collaboration for dose assessments in a radiation emergency.Radiat Meas 2011;46:912-5. Sugarman SL, Livingston GK, Stricklin DL, Abbott MG, Wilkins RC, Romm H, et al. The Internet's role in a biodosimetric response to a radiation mass casualty event. Health Phys 2014;106 5 Suppl 2:S65-70. Fantes JA, Green DK, Elder JK, Malloy P, Evans HJ. Detecting radiation damage to human chromosomes by flow cytometry. Mutat Res 1983;119:161-8. Fantes JA, Green DK, Malloy P, Sumner AT. Flow cytometry measurements of human chromosome kinetochore labeling. Cytometry 1989;10:134-42. Nüsse M, Marx K. Flow cytometric analysis of micronuclei in cell cultures and human lymphocytes: Advantages and disadvantages. Mutat Res 1997;392:109-15. Nüsse M, Kramer J. Flow cytometric analysis of micronuclei found in cells after irradiation. Cytometry 1984;5:20-5. Wessels JM, Nüsse M. Flow cytometric detection of micronuclei by combined staining of DNA and membranes. Cytometry 1995;19:201-8. Avlasevich SL, Bryce SM, Cairns SE, Dertinger SD.In vitro micronucleus scoring by flow cytometry: Differential staining of micronuclei versus apoptotic and necrotic chromatin enhances assay reliability. Environ Mol Mutagen 2006;47:56-66. Avlasevich S, Bryce S, De Boeck M, Elhajouji A, Van Goethem F, Lynch A, et al. Flow cytometric analysis of micronuclei in mammalian cell cultures: Past, present and future. Mutagenesis 2011;26:147-52. Banáth JP, Olive PL. Expression of phosphorylated histone H2AX as a surrogate of cell killing by drugs that create DNA double-strand breaks. Cancer Res 2003;63:4347-50. MacPhail SH, Banáth JP, Yu TY, Chu EH, Lambur H, Olive PL. Expression of phosphorylated histone H2AX in cultured cell lines following exposure to X-rays. Int J Radiat Biol 2003;79:351-8. Ismail IH, Wadhra TI, Hammarsten O. An optimized method for detecting gamma-H2AX in blood cells reveals a significant interindividual variation in the gamma-H2AX response among humans. Nucleic Acids Res 2007;35:e36. Zuba-Surma EK, Kucia M, Abdel-Latif A, Lillard JW Jr., Ratajczak MZ. The ImageStream System: A key step to a new era in imaging. Folia Histochem Cytobiol 2007;45:279-90. Rodrigues MA, Probst CE, Beaton-Green LA, Wilkins RC. The effect of an optimized imaging flow cytometry analysis template on sample throughput in the reduced culture cytokinesis-block micronucleus assay. Radiat Prot Dosimetry 2016;172:223-9. Rodrigues MA, Beaton-Green LA, Wilkins RC. Validation of the cytokinesis-block micronucleus assay using imaging flow cytometry for high throughput radiation biodosimetry. Health Phys 2016;110:29-36. Rodrigues MA, Beaton-Green LA, Kutzner BC, Wilkins RC. Multi-parameter dose estimations in radiation biodosimetry using the automated cytokinesis-block micronucleus assay with imaging flow cytometry. Cytometry A 2014;85:883-93. Rodrigues MA, Beaton-Green LA, Kutzner BC, Wilkins RC. Automated analysis of the cytokinesis-block micronucleus assay for radiation biodosimetry using imaging flow cytometry. Radiat Environ Biophys 2014;53:273-82. Rodrigues MA, Probst CE, Beaton-Green LA, Wilkins RC. Optimized automated data analysis for the cytokinesis-block micronucleus assay using imaging flow cytometry for high throughput radiation biodosimetry. Cytometry A 2016;89:653-62. Beaton-Green LA, Wilkins RC. Quantitation of chromosome damage by imaging flow cytometry. Methods in molecular biology. In: Barteneva NS, Vorobjev IA, editors. Imaging Flow Cytometry: Methods and Protocols. New York: Springer; 2015. p. 97-110. Beaton LA, Ferrarotto C, Kutzner BC, McNamee JP, Bellier PV, Wilkins RC. Analysis of chromosome damage for biodosimetry using imaging flow cytometry. Mutat Res 2013;756:192-5. Bourton EC, Plowman PN, Zahir SA, Senguloglu GU, Serrai H, Bottley G, et al. Multispectral imaging flow cytometry reveals distinct frequencies of γ-H2AX foci induction in DNA double strand break repair defective human cell lines. Cytometry A 2012;81:130-7. Lindholm C, Tekkel M, Veidebaum T, Ilus T, Salomaa S. Persistence of translocations after accidental exposure to ionizing radiation. Int J Radiat Biol 1998;74:565-71. M'kacher R, El Maalouf E, Terzoudi G, Ricoul M, Heidingsfelder L, Karachristou I, et al. Detection and automated scoring of dicentric chromosomes in nonstimulated lymphocyte prematurely condensed chromosomes after telomere and centromere staining. Int J Radiat Oncol Biol Phys 2015;91:640-9. Vral A, Thierens H, De Ridder L.In vitro micronucleus-centromere assay to detect radiation-damage induced by low doses in human lymphocytes. Int J Radiat Biol 1997;71:61-8. Hayashi M, Hattori A, Kim H, Terazono H, Kaneko T, Yasuda K. Fully automated on-chip imaging flow cytometry system with disposable contamination-free plastic re-cultivation chip. Int J Mol Sci 2011;12:3618-34. Garty G, Chen Y, Salerno A, Turner H, Zhang J, Lyulko O, et al. The RABIT: A rapid automated biodosimetry tool for radiological triage. Health Phys 2010;98:209-17.